The June 2011 forecast of the size of the hypoxic zone in the northern Gulf of Mexico for July 2011 is that it will cover between 22,253 to 26,515 km2 (average 24,400 km2 ; 9,421 mi2) of the bottom of the continental shelf off Louisiana and Texas. The predicted hypoxic area is about the size of the combined land area of New Jersey and Delaware, or the size of Lake Erie. The estimate is based on the May nitrogen loading (as nitrate+nitrite) from the Mississippi watershed to the Gulf of Mexico estimated by the U.S. Geological Survey. If the area of hypoxia becomes this large, then it will be the largest since systematic mapping of the hypoxic zone began in 1985. 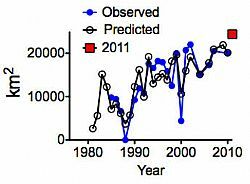 The prediction is the result of research done by Nancy N. Rabalais and R. Eugene Turner, with support from the NOAA Center for Sponsored Coastal Ocean Research, Coastal Ocean Program Grants. A follow-up assessment will be made at the end of the summer, and the report on that effort will appear on GulfHypoxia.net.